More people everywhere means more ships hauling more species back and forth, which means the spread of non-native species. 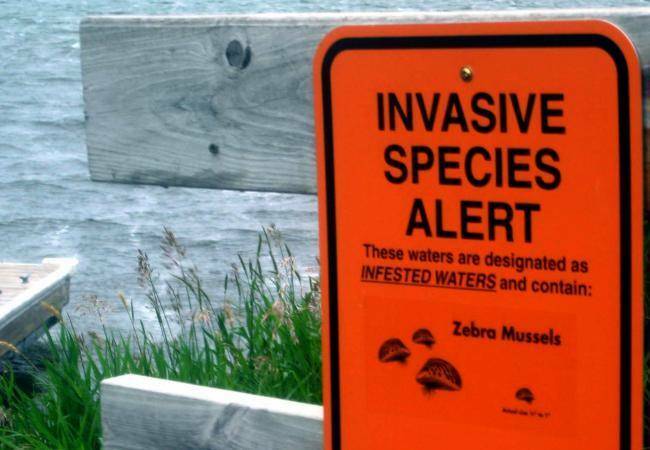 Pumped-up trade between growing (in population and wealth) countries also spreads invasive species. Freighters bring hitch-hiking harmful exotics, such as zebra and quagga mussels, green crabs, and the spiny water-flea. When folks go into new lands, they hack out welcome ground for invasive, exotic, weedy life that pushes out native species. Plant diseases, such as Dutch elm disease and chestnut blight, are among the most deadly things spread by trade and shifting settlements. Such ills lead to upheavals in native-plant communities. Back in 1971, biologist Daniel McKinley warned, “All animals create waste, but only man makes products that nature cannot reclaim, and at such a rate that he can spoil the world before it purifies itself.” This Man-waste not only sickens and kills children, women, and men, but also even more so harms and kills other Earthlings. People spray and spill biocides and befoul Earth with all kinds of banes. Worldwide, it may seem that people in wealthy lands pollute more than do those of the third-world countries. But down on the ground or in the water, peasants can spread and spill more banes than do most Europeans or Americans. Likewise, Americans in the hinterlands are more lackadaisical in handling them than even suburban yard lords. All too often, the lower on the ladder of income and schooling one goes, whether in Essex County, New York, or the slums of Lagos, the lower the understanding of how awful some chemical brews can be. Thickening settlements lead to even more smoke and filth, many kinds of which are biocides to wild things. The spread of Homo sapiens, whether as suburbanites, city dwellers, or peasants onto new lands, brings spilling of pesticides, motor oil, antifreeze, and other nasty crud. Leaping industrialization in China, India, and other booming third-world countries is happening more sloppily than in other lands. Poisoned, polluted, and dirty land, air, and water exist where there is little or no oversight. The evil banes aren’t all homemade, though; some are rich nations’ exports of junked computers and other electronic gadgets for recycling—a witch’s brew of world and local pollution. In wealthy lands, laws, regulations, and enforcement are better and watchdogging is better. In the third-world countries, there is little oversight of how people deal with toxics, pesticides, and oil. Wherever pollution exists, growing numbers of us means more spreading of it. Much as we would like to get rid of these problems, we must acknowledge that more of us brings more pollutants and poisons. It’s hard to clean up a mess when the number of those making the mess grows every year, sometimes twice as many every score of years. Stay tuned for Wound 7: Climate Change and Ocean Acidification!